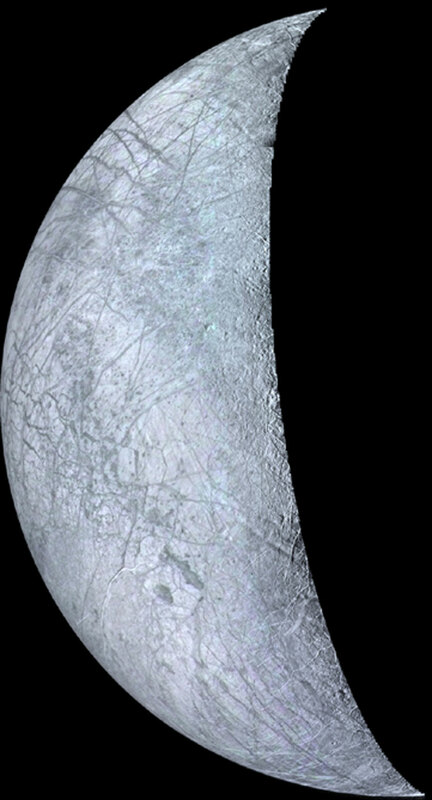 Chlorophyll has never been discovered on Europa, nor is it ever likely to be. An oft-quoted statement that it has been is based on the fictional work "2010", by Arthur Clarke. 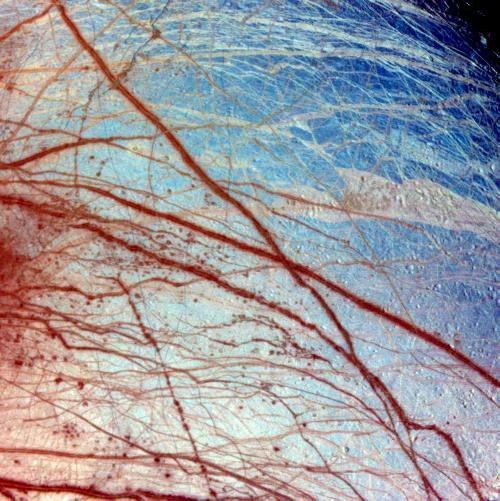 Although the discussion in the book and corresponding movie was fictional, there are those who think life might exist on Europa, and in fact NASA plans (in the distant future) to have a mission to Europa to explore that possibility. As a result of misquoting or misunderstanding, the fictional "discovery" is occasionally referred to in the press as if real, and as a result the mistake has spread across the Internet as a modern myth. 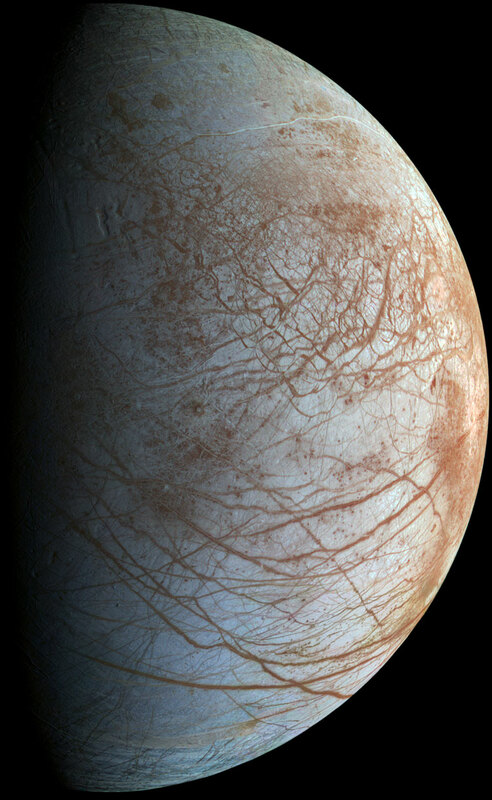 The reality is, Europa's surface appears to be covered with shifting sheets of ice separated by dark rifts which are thought to be thinner, fresher ice created when the surface shifts and water pushes its way up from below (probably many miles below). It has been theorized that a water ocean buried beneath the surface ice might contain life, and that the dark rifts might contain some evidence of organic materials, or even micro-organisms trapped in the upwelling material. 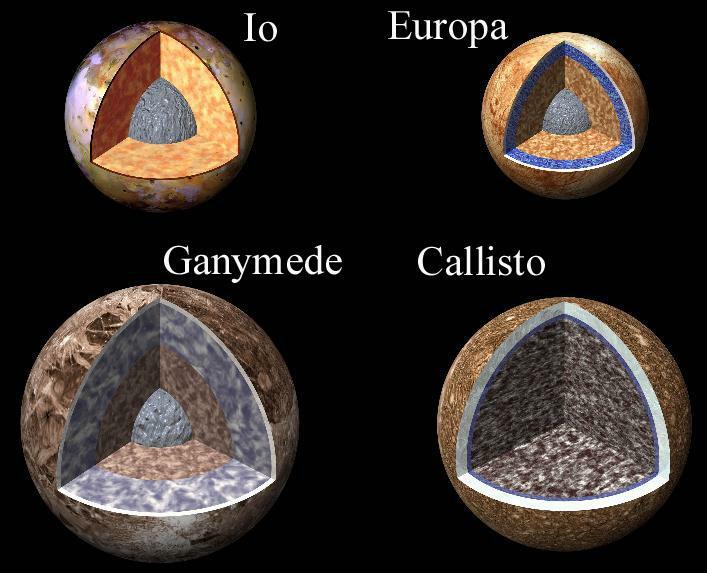 However, there is at present no evidence that even primitive organic materials exist on Europa, let alone complex materials such as chlorophyll. 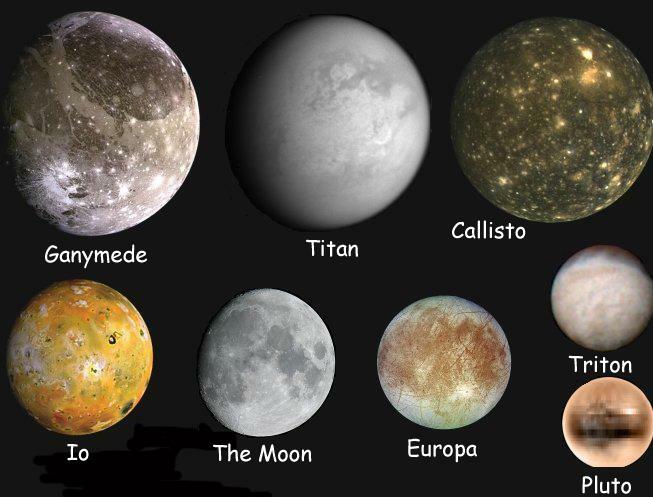 In addition, chlorophyll's ability to transform sunlight into usable biological energy would be completely useless miles beneath the icy surface of Europa, so even if complex organic compounds exist on Europa, chlorophyll is one of the least likely candidates imaginable. 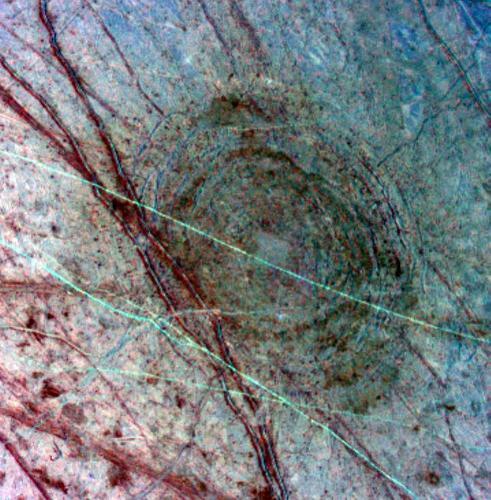 The trailing side of Europa, imaged by Galileo. An exceptionally smooth surface covered with shifting ice sheets. The darker streaks and other dark areas are areas of dirty ice. The crescent Europa image above, considerably reprocessed to enhance detail. The processing used supersaturated color, in contrast to the "natural-color" image below. 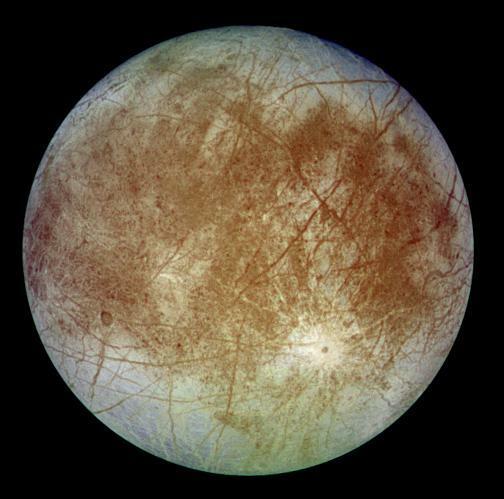 An image of Europa taken by the Galileo spacecraft in the late 1990's, reprocessed with modern software by NASA in 2014 to show Europa in "natural color" with as much detail as possible. (Image credit NASA/JPL-Caltech/SETI Institute). A closer view of the dirty streaks, intermixed with cleaner ice. Shifting ice structures near the Earth's North Pole in mid-Spring (early May, 2000). 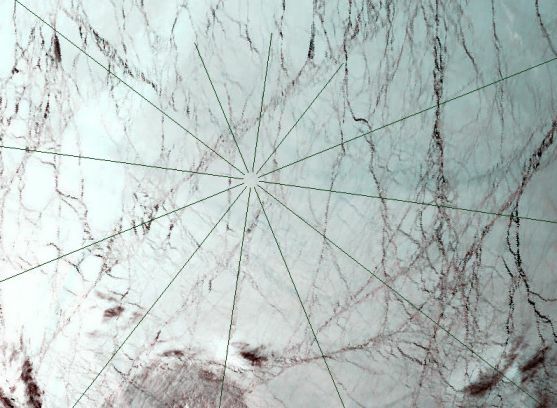 Note the similarity of the "leads" of open ice and slush to the cracks on Europa's surface. 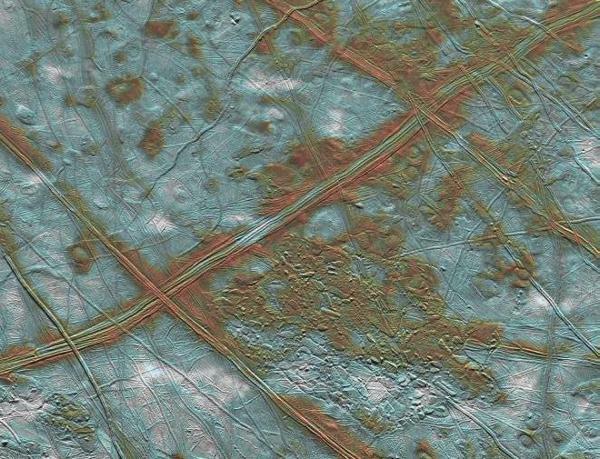 Rafts and ridges of material on Europa. 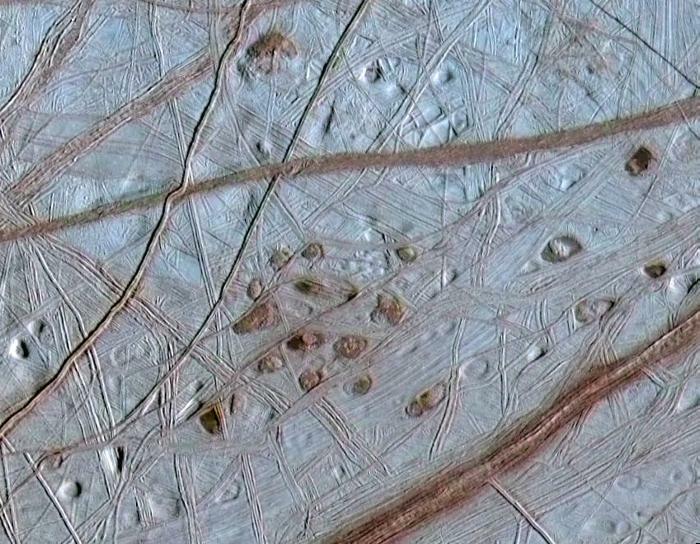 Another view of rafts and ridges on Europa. Closeup of Lenticulae ("freckles") on Europa. Probably areas where blobs of warmer ice have penetrated through surface layers. If there is an ocean below the icy surface, it might be reached more easily at such places than elsewhere. 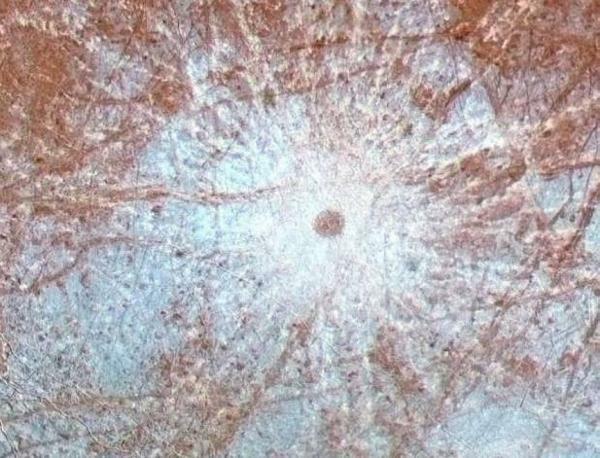 An icy crater, Pwyll, thought to be one of the youngest features on Europa. The crater is about 15 miles across, and rays of debris (water ice?) extend for hundreds of miles. 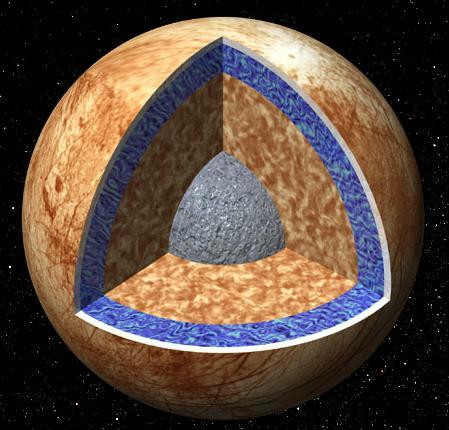 Another impact structure, almost 90 miles across, on Europa. In this case, since other features cross through the structure, it must be older than them.